« Off to the Balloon Fiesta! This entry was posted on October 15, 2015 at 1:00 am and is filed under Thursday Tangents. You can follow any responses to this entry through the RSS 2.0 feed. You can leave a response, or trackback from your own site. Good point about the intelligence tests. Even with humans, there have been complaints abut kids not doing well on them because they are not geared to city (or country) places where some kids live. Some of our animal tests, as with the mazes, are probably foreign to various animals. I have a horse who comes when I whistle only if there’s something in it for him – if he has a grazing muzzle he thinks I will remove, or if he thinks I might have a carrot. Otherwise, he continues grazing. So he’s smart enough to listen, think it over, and make a decision. AFAICT, the intelligence being measured in most of these tests is the tester’s. Well, that’s the way multispecies civilization is supposed to work, as a series of accommodations. 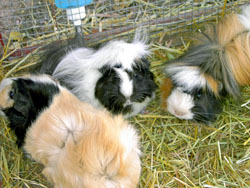 Another interesting thing is that our domesticated species (our symbionts, really) are those that can crack our communications code sufficiently that we can accommodate each other, as when guinea pigs teach us how they want to by picked up. Most other species haven’t managed this trick, even when (like, say, African elephants) they are extremely intelligent and social. Even with some social species (and here I’m thinking of the parrot family) our accommodations are usually pretty hard on the non-human members of the group. I highly recommend the book Alex and Me by Irene Pepperburg. She talks about her experience working with an African Grey Parrot in a variety of research settings. She specifically mentions that Alex (the bird) would do very intelligent things that simply could not be formally described according to research protocol. At the book signing with her that I attended, she also said that most lab experiments on birds at the time she started her work was done in ridiculously artificial settings on birds that had been starved down to about 80% of a healthy body weight (with things like Skinner boxes). The questions you have to ask about animal behavior are “what problems it is naturally trying to solve?” and “What kind of toolkit does it have to solve them?” Domestic dogs are very good at understanding and manipulating humans for instance, because humans define their environment. Excellent comments! For those of you interested in parrots, I’d recommend THE PARROT DETECTIVE by Gerald and Lorretta Hausman. The parrot in the book is based on their own parrot, George, and they claim his behaviors in the book are within keeping with what they’ve observed over the many years of their co-residence. Full disclosure… I’ve known the Hausmans for many years. Gerry co-wrote WILDERNESS with Roger Zelazny.